Hegland served in the Peace Corps in Iran from 1966 to1968 and returned for visits from 1971 to 1972 and the summers of 1970 and 1976. She returned again to study the agricultural credit system primarily in the village of Aliabad from June, 1978, to December, 1979, the period of the Islamic Revolution. She returned again for visits between 2003 and 2008. Thus she had a unique opportunity to experience living in Iran before, during, and after the Revolution. The book is presented as an anthropological study, avoiding most personal feelings, opinions, and reactions to what she observed. Her life there she calls “field work”; her friends and acquaintances she calls “informants.” She refers to “agriculturalists” and “religious specialists.” Going home she calls “leaving the field.” She describes powerful emotions and passions in the villagers, but always in the objective, disinterested voice of a social scientist. This is not a story about her but about them. 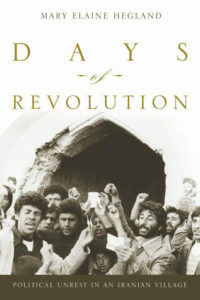 The thesis of the book is that the ancient system of taifeh-keshi or faction-forming for protection and to obtain justice explains the peasant revolt of the 1950s, the acceptance of the Shah after the overthrow of Mosaddeq, the land and water disputes she observed in the 1970s, and the shift of most villagers towards the anti-Shah Revolution in the late 1970s. The corollary is that after the Revolution, taifeh-keshi no longer worked and was abandoned. What rendered this ancient system of challenging authority and taking sides ineffective was the modernization and material improvement of the lives of the people in the post-revolutionary period. The book explains in great detail how taifeh-keshi works on various levels, from choosing spouses, to petty land disputes, to taking sides in a national revolution. Rejecting one leader or boss usually involves sangar or partisan entrenchment, she points out, and some of the more interesting passages in the book describe the resulting fights and their outcome. Other interesting passages describe the unique way women function in this society. There are concrete details and examples to give a picture of their lives. And the book gives a detailed picture of how Iranian agricultural society operates, or operated up to the Revolution. For the most part, though, the book relies on generalized observations, almost as if to give the text validity as an academic study. The chapters or sections begin with an abstract or precis, followed by elaboration with extensive recapitulation, followed by a summary. In new sections or chapters, there is a tendency to re-explain things from previous sections, perhaps assuming that parts of the book should be able to stand alone. The reader who is not an anthropologist might come away from the book with unanswered questions. What did the author do all day? What was her human relation to the people she knew and lived with? There is one reference to a notebook, but when and where did the author take her notes? In what language? And presumably, her young daughter became somewhat assimilated to the Iranian culture; wouldn’t that be a pertinent thing to note? I read this book with interest up to the end, waiting to see how these villagers were going to react to the Islamic Revolution. All along, although the author describes them as performing religious rituals, some more assiduously than others, she never discusses any details of their religious (as opposed to cultural) beliefs. When the Revolution comes, she depicts them as unaware of or uninterested in its religious philosophy. There is one mention of the “morality police” after the Revolution—something most Americans regard an abhorrent aspect of the Revolution—but these police are not shown to have any effect on the villagers. The aspect of Islam they are interested in is the belief that private property must be respected and that there should not be a great disparity between the rich and the poor. The depiction of the gradual way the Aliabadis and Shirazis go over to the Revolution is one of the more interesting aspects of the book. Basically, it was a matter of changing sides from one strong man to another, according to the author.